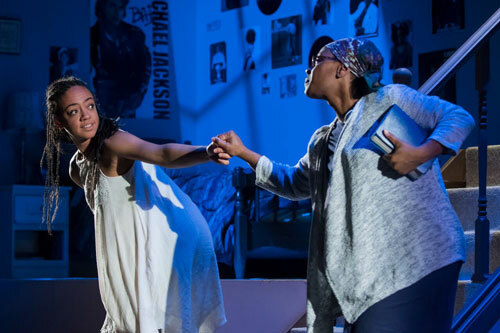 How Black Mothers Say I Love You, on now at Factory Theatre, made me bawl because I’m a sucker for a dying mother and because it’s just so well done. The first thing I admired about the production was the set, a three tiered thing of detailed beauty. On the main level is a cheery yellow kitchen with fruit-shaped fridge magnets, religious iconography, and a mortar and pestle among other touches and the usual appliances and furniture. The second floor is a blue bedroom straight out of the 80s, with records and posters of Michael Jackson and Prince on the walls. At the top of the stairs and the middle of the stage is a landing painted soft pink. The house looks like a textbook example of a “happy home”, but underlying familial dysfunction is hinted at with the top corners of the walls, which are broken down and ragged. The first characters we see are an old woman, Daphne (Ordena Stephens-Thompson), merrily cooking, and a young girl who we later find out is the now-dead Cloe (Beryl Bain) wordlessly doting on her. Their moment is broken when Claudette appears. Claudette (Khadijah Roberts-Abdullah) is one of Daphne’s two living daughters. She has been called by her sister, Valerie (Allison Edwards-Crewe), because their mother is dying of cancer. Claudette has been away for three years because her mother cannot accept that she is gay. The plot that ensues is rife with common tropes but not ones that diminish the characters. When Val goes on a rant about how it must be “easier” for Claudette to date woman it was like a litany of every well-intentioned but clueless and microagressive thing I have heard from straight women in my life. Similarly, Daphne’s refusal to hear anything about her daughter’s “lifestyle” rang true. These are not baseless stereotypes, but the reality for too many of us queer folk. Race is also, obviously, a huge factor, including shadism. Val’s husband is white and has an affair with a white woman, causing Val to feel the pain of racist beauty conventions. Cloe is the product of Daphne’s marriage to a white man, and Claudette feels that she is more treasured to her mother than her sisters whose skin is darker. Playwright Trey Anthony draws on the experience of both her grandmothers, who left their children in Jamaica to work in a predominately white country. Anthony plumbs this generational trauma to create a story of poignant truth about racism, colonialism, and their effect on the family. The only quibble I have with the piece is that Bain steps out of her role as a ghost to play two minor characters with voices, both in the second act. If this had happened at least once in the first act it would have been more expected, and flowed better into the second. All the women are powerful presences, mining material that could seem surface level if it weren’t for the sincerity of the script and their commitment to the characters. The humour is also charming and important to the experience, as the text and performances kept me laughing long enough to be vulnerable to the eventual emotional impact. Anthony’s Da Kink In My Hair is an acknowledged contribution to our country’s theatrical repertoire, and How Black Mothers Say I Love You is just as worthy. Trey Anthony is a national treasure. How Black Mothers Say I Love You is playing at Factory Theatre, 125 Bathurst Street until March 5, 2017. Ticket prices range from $25 – $35 and can be purchased online or through the box office at (416) 504-9971.